Harvestmen are arachnids in the order Opiliones. The scientific name of this group comes from the Latin word opilo, which roughly translates to shepherd. At one time European shepherds used stilts to look over their sheep, and it is thought that the look of this arachnid’s body atop its long legs inspired the comparison. 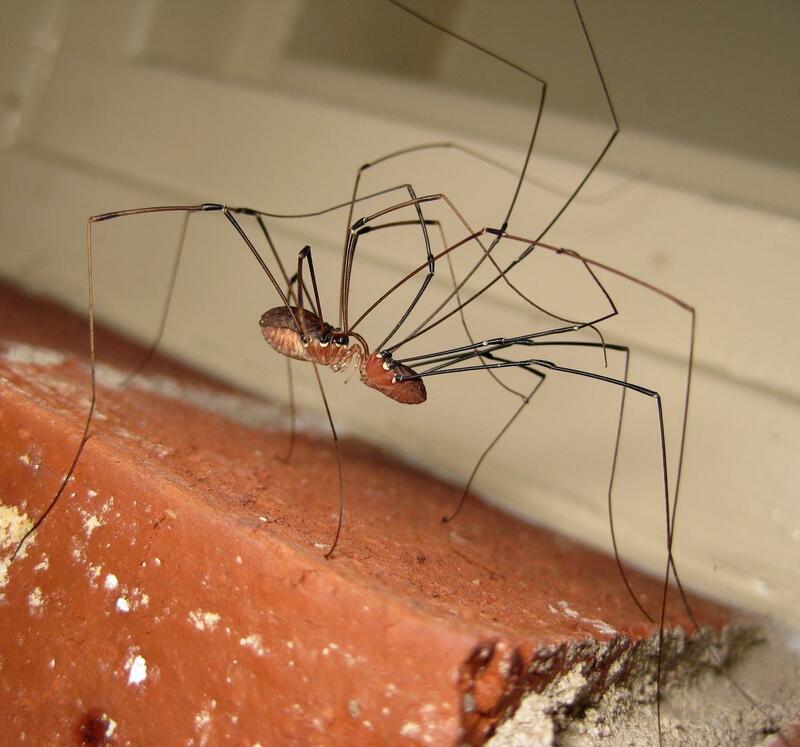 Harvestmen are referred to by many common names including shepherd’s spiders, harvest spiders, reapers, and here in the United States where our fauna is dominated by long-legged species, daddy longlegs. Harvestmen are related to spiders—both are in the class Arachnida. Yet there are some important differences among these creatures, including their eyes. Harvestmen have an ocularium, which is a raised area centered on their prosoma that contains two eyes, whereas spiders have 6–8 eyes. Photo courtesy of MaLisa Spring. 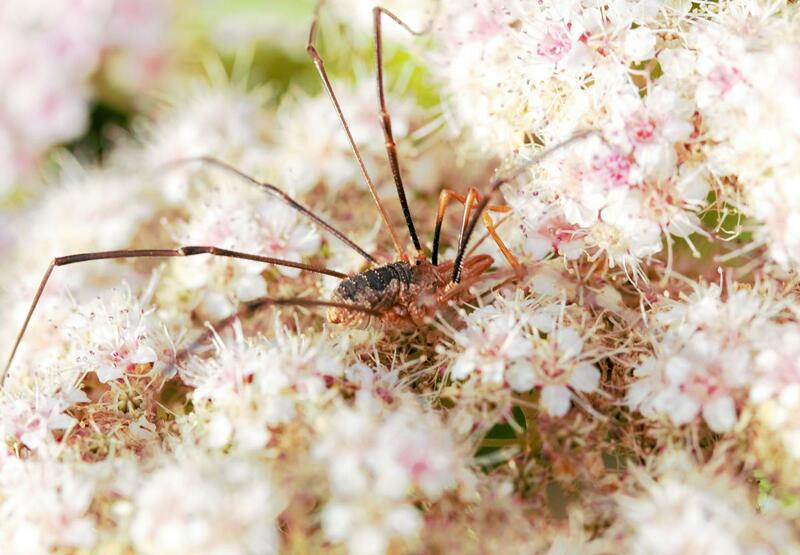 Harvestmen are beneficial predators in the garden and very common in residential landscapes. They can be found on the soil surface, and under rocks or mulch. They are also commonly found on structures, tree trunks or climbing garden vegetation. While the presence of harvestmen is not likely to completely suppress pest populations, they do contribute to biological control. Harvestmen are very susceptible to dehydration, thus providing garden elements such as rocks, mulch and logs to provide shelter from heat and direct sunlight is important to promoting harvestmen. Growing a diversity of flowering plants to support bloom throughout the growing season will provide protein in the form of pollen, which may be an important resource at times of low prey availability. Also, avoiding the use of broad spectrum insecticides is advised. Harvestmen are arachnids and look a lot like spiders, but they have some important differences. Harvestmen have fewer eyes, do not make webs and do not produce venom. The urban legend about harvestmen producing the most deadly venom but lacking the ability to bite a human is simply not true! Like all arachnids, harvestmen have a two-segmented body consisting of a prosoma and an opisthosoma. 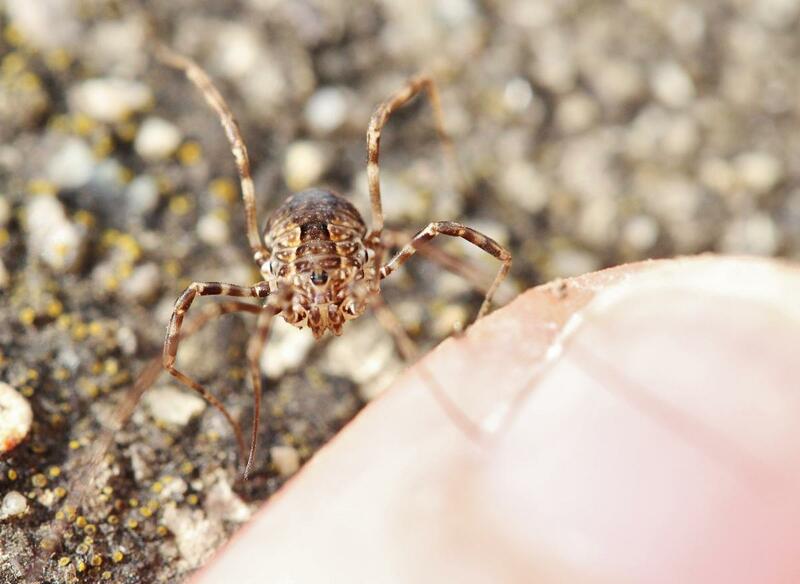 In harvestmen these body segments do not narrow where they join, giving the appearance of an oval, single-segmented body that ranges in length from 2 to 10 mm. They have four pairs of long, slender legs and one pair of pedipalps on their prosoma, which are short appendages near their chelicerae or mouthparts that are used in prey capture, feeding and mating. They are cryptically colored and blend in well with surroundings. 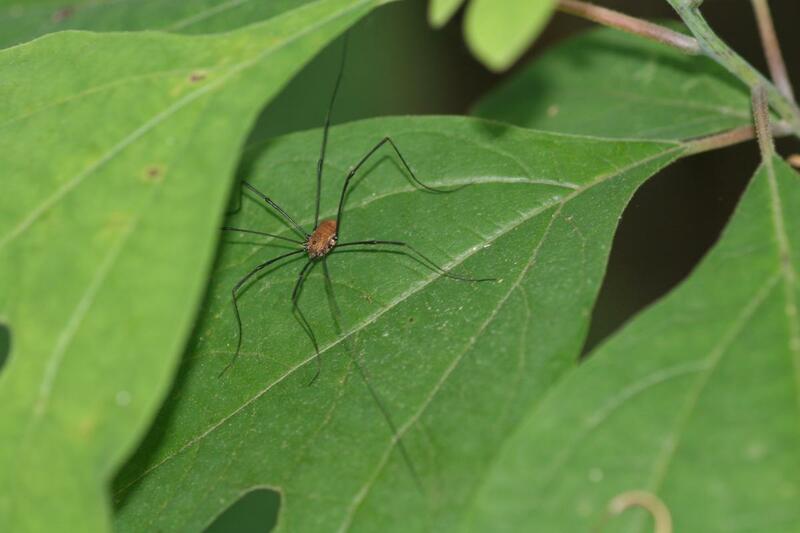 Several species of harvestmen are found in Ohio gardens. Phalagium opilio (Phalangiidae), and species in the genus Leiobunum (Sclerosomatidae) are common in Ohio residential landscapes. Phalagium opilio is found commonly in garden beds. This individual may have been feeding on pollen. Growing a wide variety of flowering plants in your landscape will provide natural enemies with a diversity of prey as well as nectar and pollen resources. Harvestmen use their second pair of legs to acquire vibrational cues from possible nearby prey or potential predators. This Leiobunum individual has its second pair of legs outstretched to survey the environment. Most harvestmen mate to reproduce but a few species are parthenogenic, meaning that the females can produce offspring in the absence of males. After mating, females utilize their long ovipositors to deposit eggs singly or in groups in protected cavities under tree bark, soil or mulch. In some species, females guard eggs until they hatch. Harvestmen will hatch from their eggs and molt though several immature stages before reaching adulthood. The length of the adult stage varies from 1 to 2 months to a year or more. In temperate climates, harvestmen can overwinter as eggs, immatures or adults in protected sites. Harvestmen mate directly, unlike spiders where sperm is transferred indirectly via a pedipalp to the female. As part of their courtship some male harvestmen produce a “nuptial gift”— a source of food produced from his chelicerae that the female consumes during mating. After mating the male will guard his mate until she lays eggs. Photo courtesy of John Maxwell. Harvestmen consume many types of pest insects. This individual is feeding on an invasive brown marmorated stink bug (Halyomorpha halys). Photo courtesy of Ted Kropiewnicki. Harvestmen are able to distinguish varying intensities of light with their two eyes, but they rely mostly on other cues to navigate their environment and search for prey. Their second pair of legs contains sensory hairs that can detect vibrations and possibly olfactory cues from prey within their vicinity. Unlike spiders who inject venom into their prey, harvestmen simply grasp it with their chelicerae and pedipalps and tear it apart to consume it. 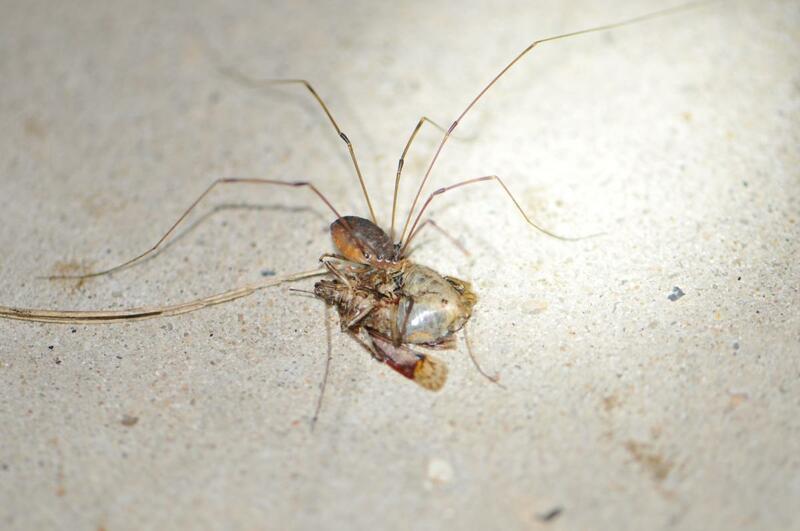 Harvestmen are known to consume both dead and live soft-bodied prey. They are generalist predators who feed on many arthropod groups that include pest species such as aphids, psyllids, grasshoppers, beetle larvae, slugs, mites and caterpillars. As generalists, they will also capture and consume other beneficial arthropods including lady beetle eggs, spiders and other harvestmen. They are also known to occasionally steal prey captured by another individual! Some harvestmen have also been reported to feed on pollen. These arachnids are very susceptible to dehydration, and sources of water are important for their survival and longevity. Most species are active at night and seek shelter from the sun during the day. Safety in numbers? Aggregating may increase the effectiveness of the bobbing behavior or chemical defenses harvestmen employ to ward off potential predators. Photo courtesy of ​Bryan E. Reynolds. Harvestmen exhibit some interesting defensive behaviors. 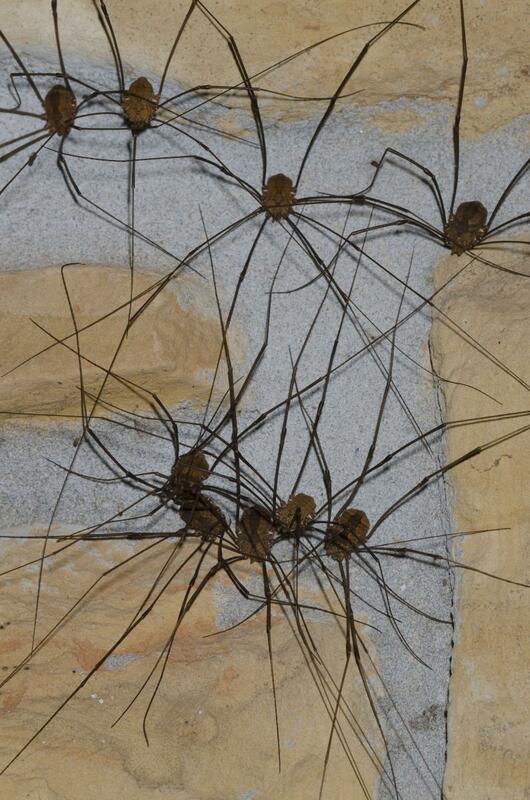 If threatened by a predator such as a bird, some harvestmen species initiate a defense called bobbing. They vibrate their body rapidly, which may make it difficult for the predator to grasp them. If a predator grasps the leg of a harvestmen they can detach it at the joint between their femur and trochanter. The detached leg will twitch for up to an hour distracting the predator. Unfortunately though, the detached leg segments do not regenerate. Harvestmen also possess chemical defenses. If disturbed they release a defensive compound from scent glands located on their prosoma. The compound can be released as a liquid or gas that encompasses the arachnid’s body. Some species will also collect the defensive liquid from their scent gland and use their leg to smear it onto a would-be attacker. Chemistry of the compound varies among species. Although harvestmen are generally found on their own, some species do form aggregations at times. Some aggregations may include hundreds of individuals. Aggregating may aid in their defense against predators, reduce water loss and/or improve mating success. Beccaloni, J. 2009. Arachnids. University of California Press. Berkeley, California. 230 pages. Pinto-da-Rocha, R., M. Glauco and G. Gonzalo. 2007. Harvestmen: The Biology of Opiliones. Harvard University Press. Boston, Massachusetts. 608 pages.